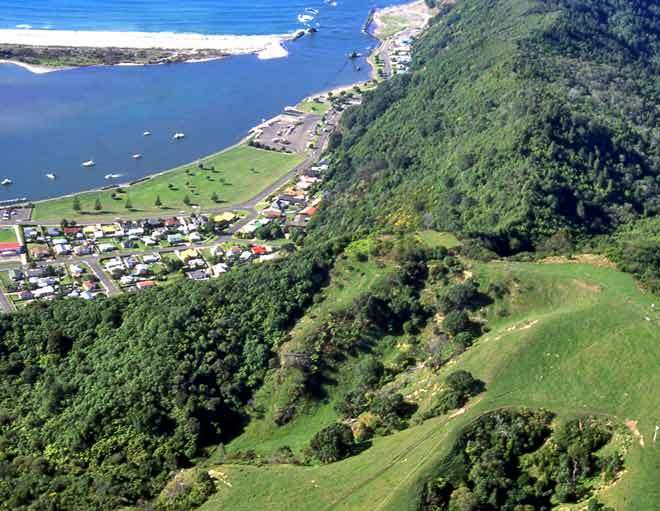 Overlooking Whakatāne, Toi's pā, Kaputerangi, is one of the oldest known pā sites in New Zealand. The pā site is the small patch of grass surrounded by bush in the centre of this view. Although Toi appears in many North Island traditions there is considerable variation among them. Some have Toi living in New Zealand, others place him in Hawaiki. His descendants are known by the names Te Tini o Toi (the multitude of Toi) and Te Tini o Awa. The people of Te Mārangaranga, Te Tini o Taunga and Ngāi Tūranga are found in the east, west and central parts of the North Island.